It was a beautiful Sunday morning, the sun was shining, the birds were chirping and the horses were kicking. Large floppy hats, small extravagant hats and a world of colours were seen from above as the guests started to arrive. Sparkling pumps stood strong as ladies were dressed in a variety of different dresses, ranging from long elegant gowns to short, summery floral dresses. The Greenwich Polo Season opening day was just ahead, as the sounds of corks popping off champagne bottles and horses neighing occupied the atmosphere. The sound of horse hooves moving fast over fresh green turf, and the clack of polo mallets colliding with the ball draw in thousands of people a year, to dress up in their fanciest frock and relish in a sun filled day complete with all the bubbly your heart desires. In previous years, around 24,000 people attended matches, however this year the club has enlisted a number of new partners in Greenwich and launched a new shuttle service in an effort to bring as many as 30,000 spectators to the annual summer competitions. Organizers of the season have been upping their game, looking to make the vent more popular and fan-friendly. 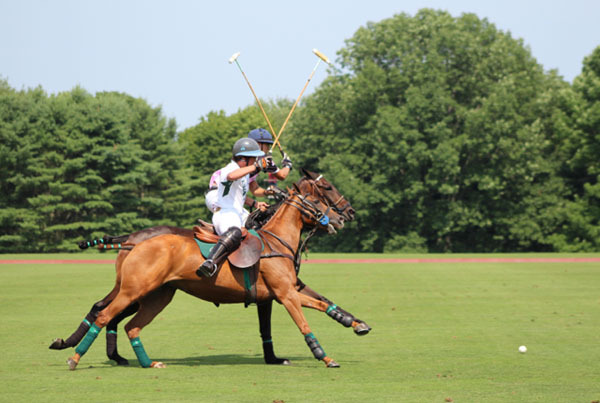 This opening day featured the 20-goal 2017 USPA Monty Waterbury Cup’s first public match. Polo teams Postage Stamp Farm (Annabelle Gundlach, Brandon Phillips, João Paulo Ganon and Kris Kampsen) and Work to Ride (Joseph Manheim, Mariano Gonzales, Mariano Aguerre and Nick Manifold) took to the field for an action-packed match. Spectators could choose to picnic on the sidelines or the VIP route, which included grandstand boxes or private cabanas seemed to be the way to go. Delicacies from food trucks such as Caffe Bon, Pappis, Dough Girls and Long Fords Ice Cream are only the beginning of the line of delicious fare. Tastings NYC hosted the Pony Bar and provided a full menu of food and drinks for those in the VIP section to lavish in. The Tastings NYC mixologists, worked there magic as they concocted polo inspired cocktails. “The Player” is the perfect potion, which will leave a long lasting impression with vodka, lemon juice, sparkling water, and a slice of lemon and sprig of mint to quench your thirst after hour’s swelting in the heat.